By Mira Sobcak | March 6, 2012. The end of April is the earliest the parish of St Catherine’s will find out when the church is due to reopen. 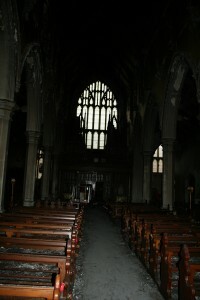 Its historic interior was severely damaged in the fire that broke out on the afternoon of 2 January. A 49-year-old man has been charged in connection with the incident and appeared in court on 3 January. He was subsequently remanded to custody and is awaiting trial. “We originally thought the church would start operating as normal on the feast of St Catherine in November, but this estimate was probably too ambitious;” said the local priest Fr Richie Goode. Howley Hayes Architects, the company in charge of the restoration, are drawing up a plan of action. “Emergency work like cleaning and protecting the most delicate objects are currently taking place,” said James Howley, the director of the company. Maírín Johnston, the author of ‘Around the Banks of Pimlico,’ who grew up in the Liberties, said the church was very important to the community. “My father installed the Stations of the Cross there around the 1890s,” she said. The local parishioners are very fond of the church where most of them were baptised, took their first holy communion and got married. A small open-air chapel, known as ‘the grotto’, behind the church was not affected by the fire and it is popular with visitors. “Our church has a great social aspect to it. We put on plays; we even do what is known as the ‘grotto lotto’. Once a week, we chip in €1.50 each and the winners of the lotto are then announced on the church notice board,” said Josie Sheahan of the Liberties’ Gray Street. Local Labour Councillor John Gallagher, who grew up in the adjoining St Nicholas of Myra parish, still remembers “the beautiful processions they always had on in St Catherine’s” and he also recalled Imelda May who used to sing in the choir there as a child. 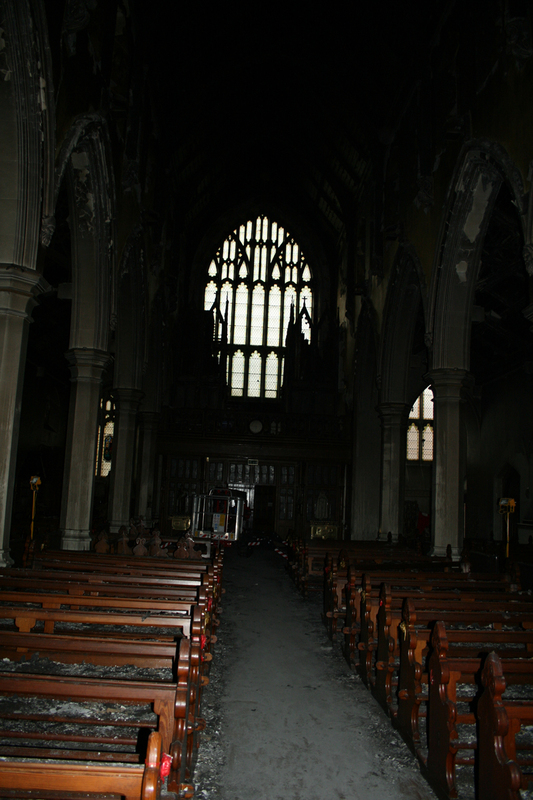 After the blaze, the parishioners had to relocate to John’s Lane church on Thomas St. Masses take place at 12:15pm every Sunday and at 8pm each weekday.